Six Secular Discalced Carmelites professed their Promise of poverty, chastity, obedience and to live the Beatitudes for the rest of their lives. Two professed to do so temporarily for three years. 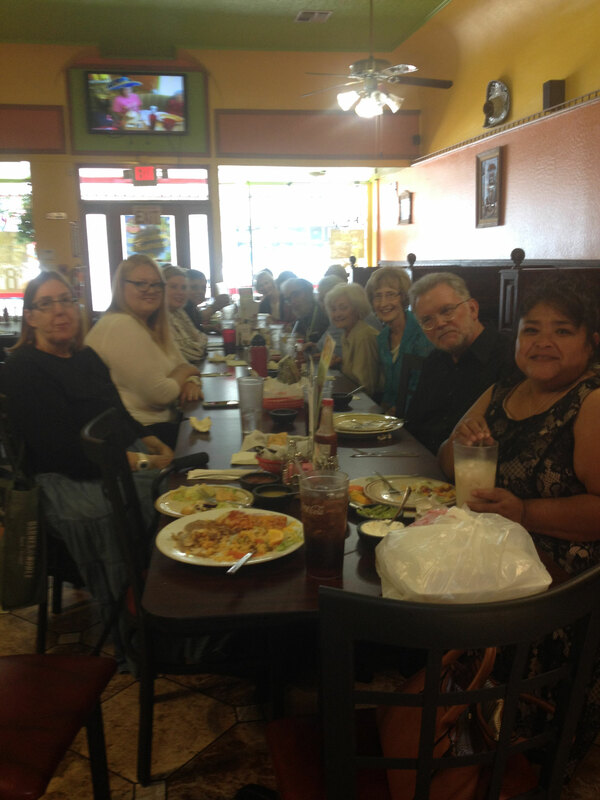 First Row from left to right: Dave Dobber from Anderson and Stephanie Strickland from Red Bluff (temporary Promise), Diane Dickson, Mary Lorenz and Kay Hilario from Redding, Jean Sargent, and Jane Shea from Red Bluff, and George Wing from Chico. 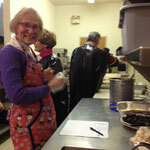 Second Row: Virginia Hall, Formation Director, Fr. Phillip Wells from Anderson, Fr. Jonathan Molina from Woodland, Fr. 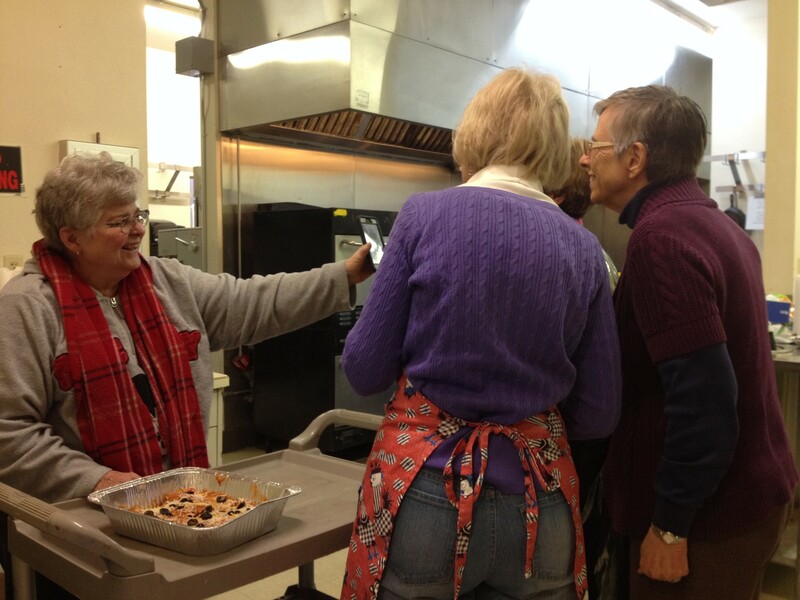 Donald Kinney, OCD - Secular Carmelite Regional Provincial Director from Redlands, Fr. 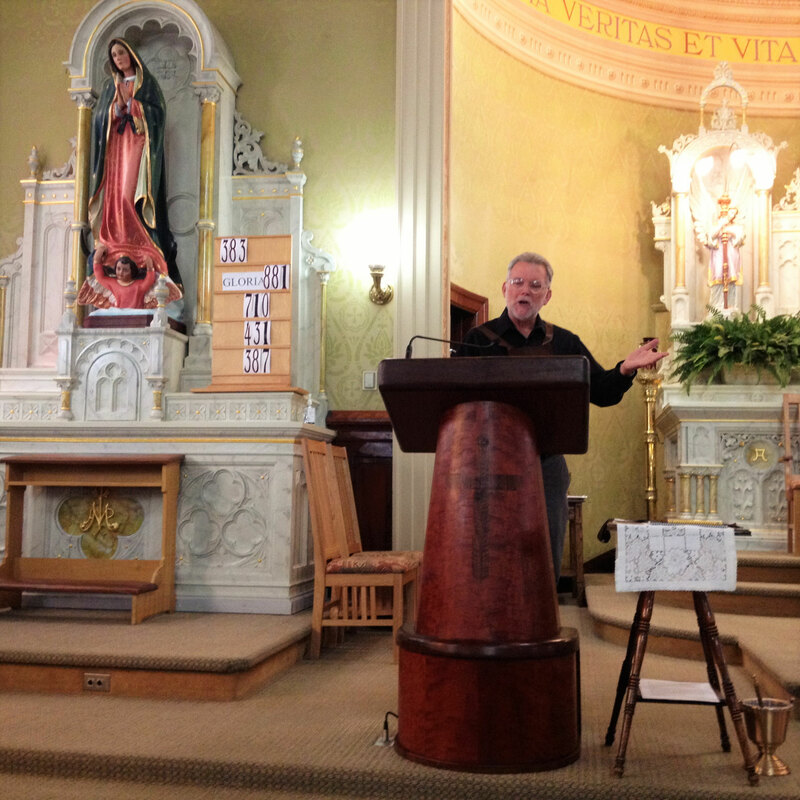 John Lawrence, Spiritual Assistant from Redding, Fr. 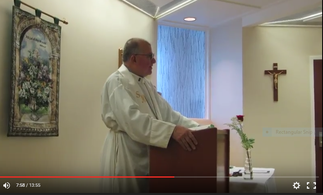 Sherwin Colaste, Red Bluff pastor, and Fr. Keith Canterbury from Weaverville. 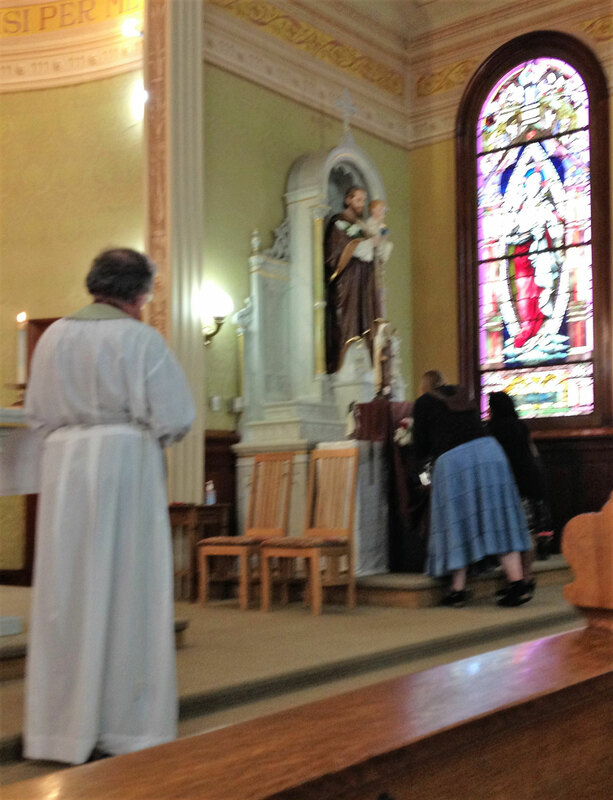 The Ceremonial Mass was celebrated in the Sacred Heart Catholic Church in Red Bluff, CA. 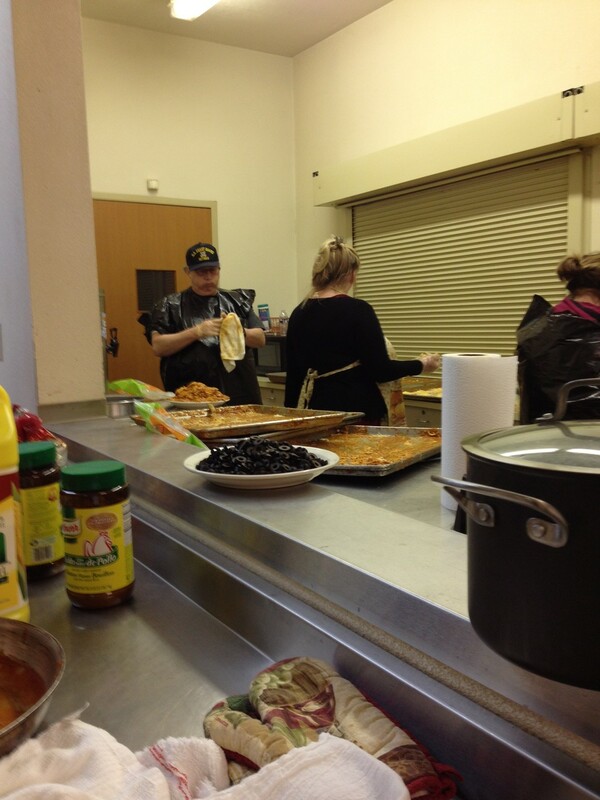 A full house banquet was held in St. Mary's Hall downstairs. 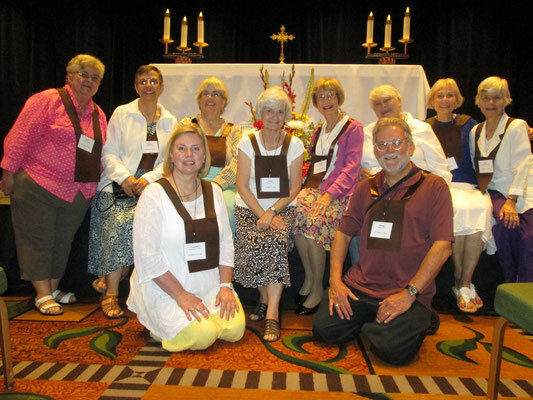 10 Red Bluff Secular Carmelite members attended the Congress on June 23-26, 2016 at the Double Tree Hilton in San Jose, had a fabulous time and were filled with the love of their Lord. Front row kneeling: Stephanie Strickland and George Wing. Jim Collins (not photographed) accompanied his wife. Maria Villalba - received into formal formation and given scapular habit. Cynthia Jinkens - made the First Promise for three years. Oh what fun we had! The Red Bluff members had the morning duty (Jane Shea, Jean Sargent, Stephanie Strickland, Marie Marine, Maria Villalba and Virginia Hall). Two were ill and unable to help. The afternoon crew were Mary Lorenz, Sandy Van Loan, Diane Dickson, Maggie Wolfer from Redding, George Wing from Chico, Dave Dobber, and Carol Schaefer from Lake, CA. A few others couldn't make it. 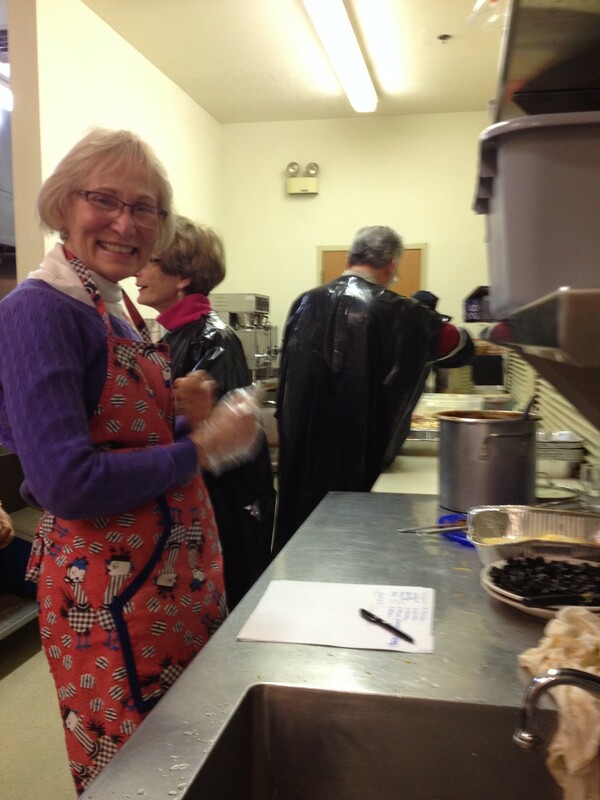 Then Maria's parents were an immeasurable help frying corn tortillas and washing pots and pans all day long! All proceeds will go to the Scholarship Fund to help members attend the triennial Secular Carmelite Congress in San Jose, CA in June at the Doubletree Hotel by Hilton for 3 days and nights. Sixty-three dozen enchiladas were created and all were sold that day, and we profited a little more than a thousand dollars! Not bad for a day's work! Thank you, Maria for being such a blessing! 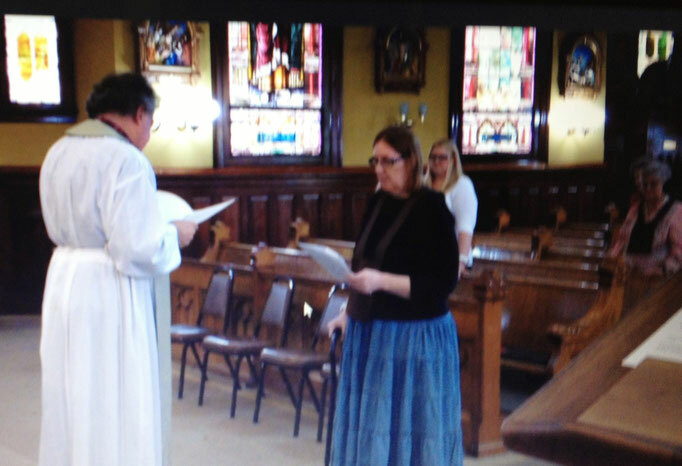 A special ceremony was held for Elaine Kaufmann at the Mercy Hospital Chapel on September 8, 2015. 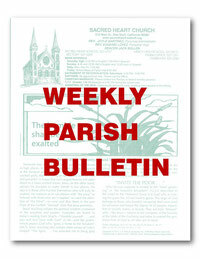 She made her definitive promises for life in the presence of many of the Secular Carmelites of the Red Bluff Group. It was not certain that she was to survive a very risky surgery the next day. Fortunately, she did and is still living. 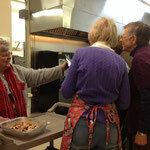 A celebratory breakfast was enjoyed by all in the hospital cafeteria. Then Elaine left to begin her pre-op preparations. It was a very special ceremony for a very special person. 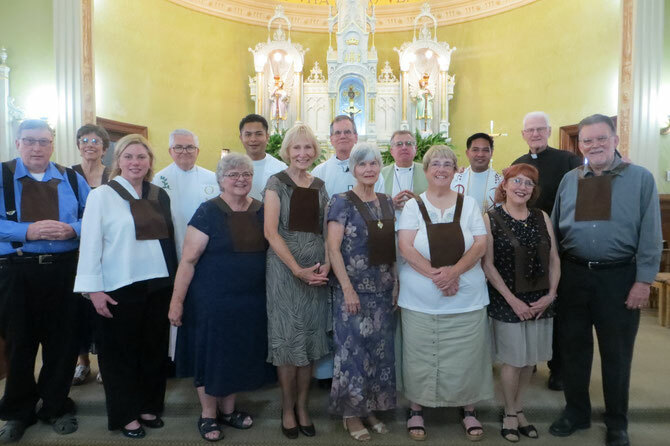 These members of the Red Bluff group of the Discalced Carmelites of the Sacred Heart of Jesus gathered in Anderson Sacred Heart Church to celebrate the Solemnity of Our Lady of Mt. Carmel. 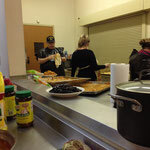 Four members from our Lady of Mercy in Redding attended the liturgical celebration at their parish and joined the group in Anderson for breakfast at the Vittles. A joyous time was had by all. 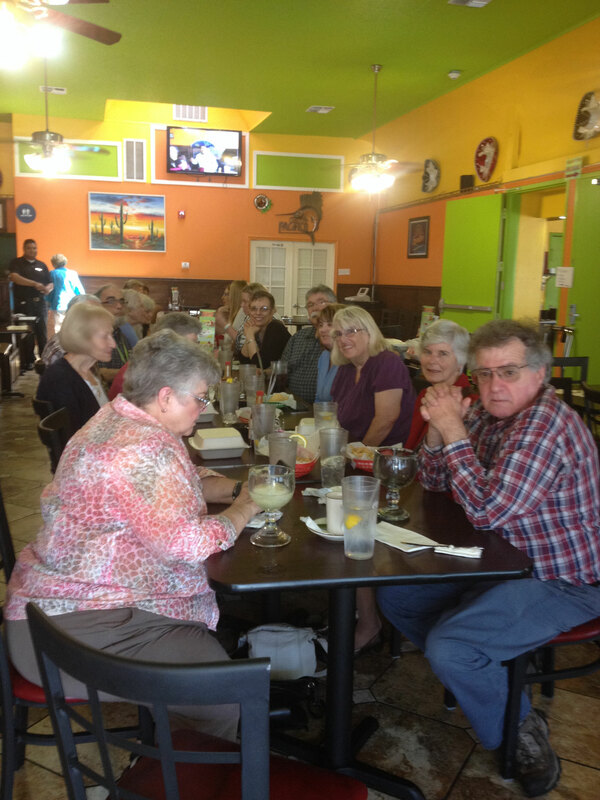 From left to right: David Dobber, Stephanie Strickland, Barbara Collins, Carol Schaefer, Virginia Hall, Maggie Wolfer, Jean Sargent and George Wing. 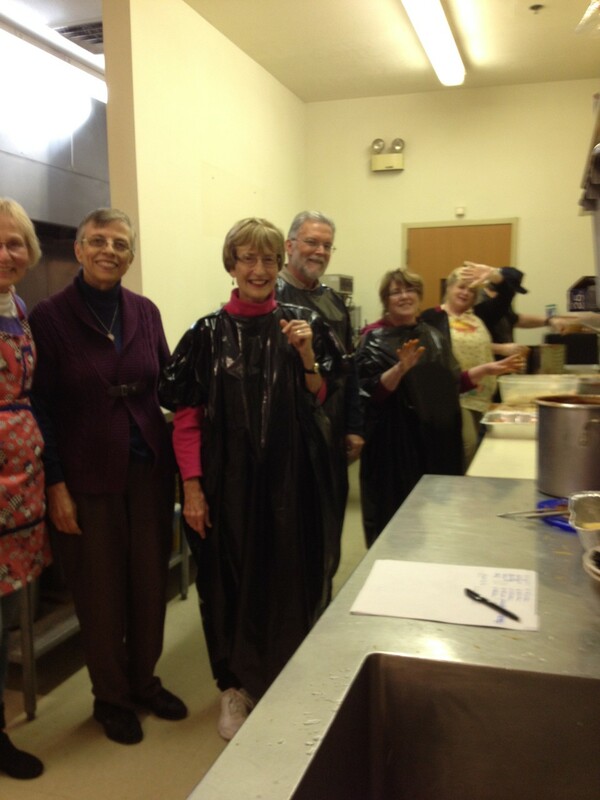 Not in photo were Diane Dickson, Kay Hilario, Mary Lorenz, and Sandy Van Loan from Redding. Left to right: Row 1: George Wing of Chico, Carol Trujillo of Red Bluff, Kay Hilario of Redding, Jane Shea, Marie Marine, and Virginia Hall of Red Bluff. Row 2: Bruce Schaefer and Carol Schaefer of Colusa, Jean Sargent, Barbara Collins of Red Bluff, Mary Lorenz of Redding and Fr. Joyle Martinez of Sacramento. Row 3: David Dobber of Anderson, Maggie Wolfer and Kathryn Wedin of Redding, Stephanie Strickland of Red Bluff. 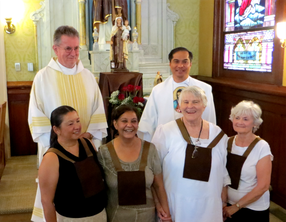 On June 20, 2015 the Secular Discalced Carmelites of the Sacred Heart of Jesus, received five aspirants and two women who made their first promises for three years. The first video clip shows the procession of all the OCDS members entering the church led by Bruce and Carol Schaefer of Colusa, Ca. Stephanie Avila is the altar server followed by Fr. John Lawrence of St. Joseph's parish in Redding. Fr. 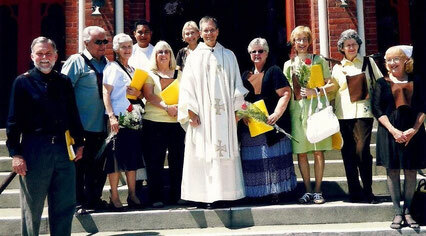 Sherwin Colaste, our pastor, is followed by Fr. 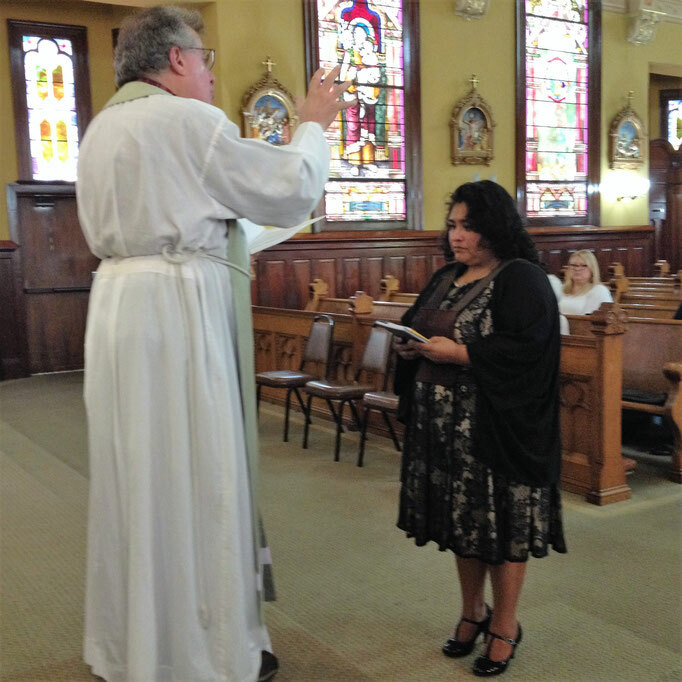 Joyle Martinez, the celebrant, from St. Paul's church in Sacramento. 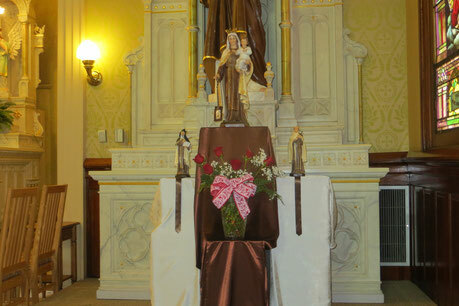 Those moving forward to the next level of formation carried a long stem red rose to give to the inspiration and model of the their Order, Our Lady of Mt. Carmel. 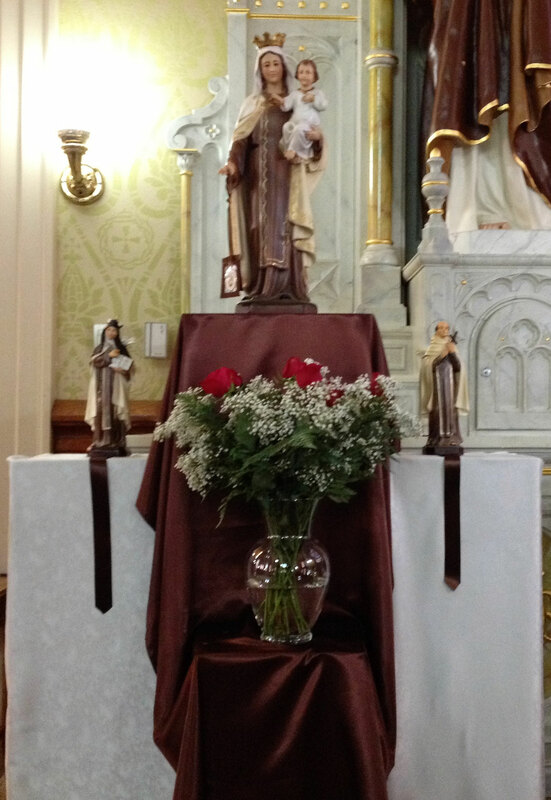 Roses were placed in the vase at the foot of Our Lady of Mt. Carmel's statue. 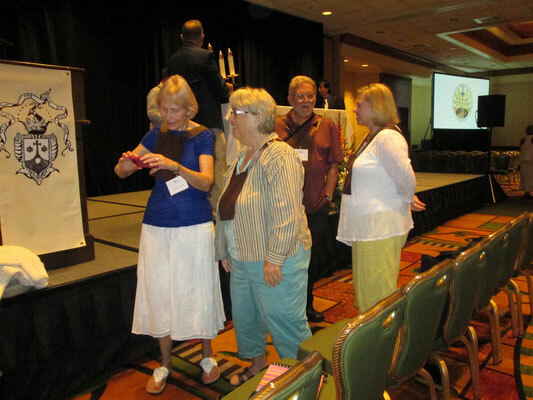 MVL_1495MOV and 1496: After the group expresses the desire to formally enter the OCDS Order, Fr. John Lawrence, gives a copy of the Gospels and Constitution of the Order to each person and shares a few words about their importance in the new members' lives. 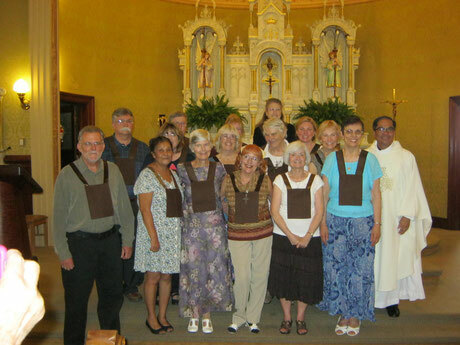 MVL_1497: The new members are vested in the brown scapular, the habit of the Secular Order, by a priest and the Director of Formation, Virginia Hall. 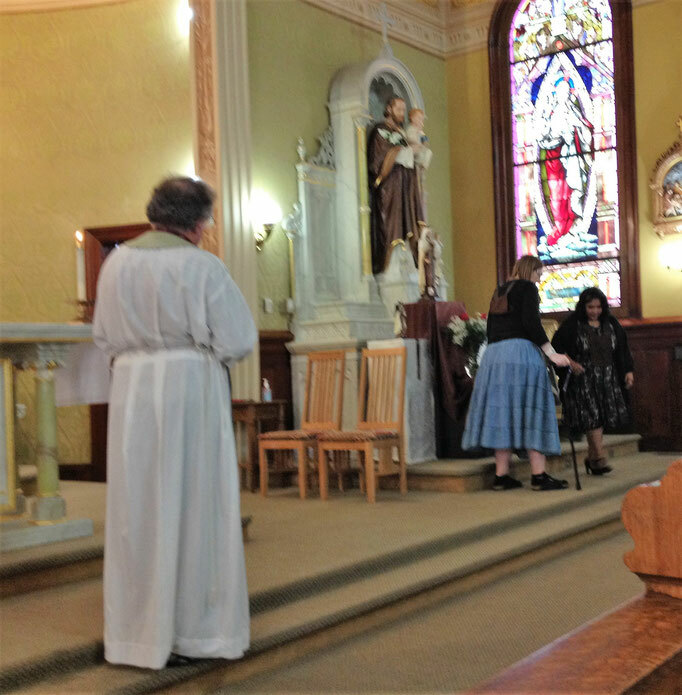 The first to receive the scapular is Stephanie Strickland of Sacred Heart Red Bluff, followed by Maggie Wolfer of St. Joseph's Redding, David Dobber of Sacred Heart Anderson, Bruce and Carol Schaefer of Colusa. MVL_1498 and 1499: There is a prayerful dialogue between the priest representing the Order and the two candidates who wish to make their first promises of poverty, chastity, and obedience and the beatitudes according to their secular way of life. MVL_1500: Barbara Collins, whose Carmelite name is Barbara of the Trinity, makes her first promises for three years followed by Marie Marine, Maryanka of the Sacred Heart. 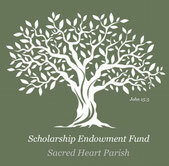 Both are from Sacred Heart parish in Red Bluff. 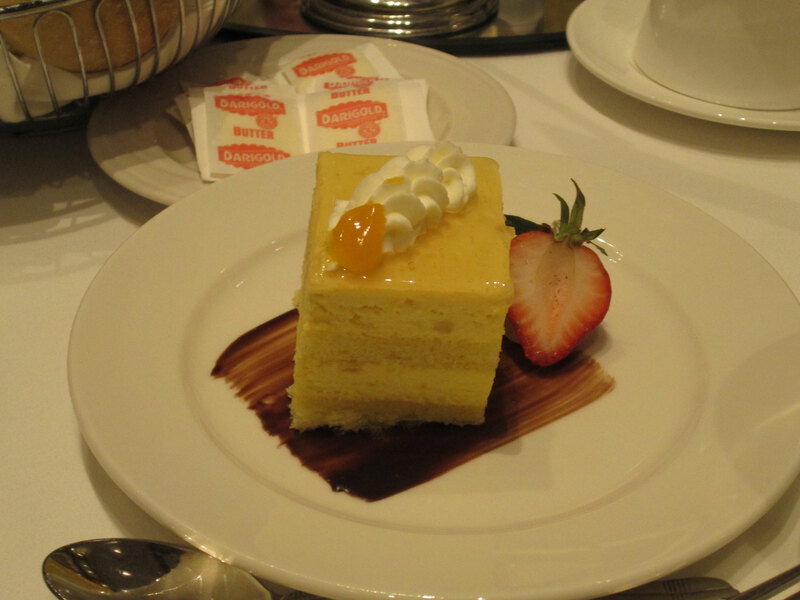 MAY 12, 2012 CEREMONIES TO RECEIVE 9 PEOPLE INTO OUR GROUP. Fr. Joyle, Fr. Jonathan from Our Lady of Mercy in Redding, and Fr. 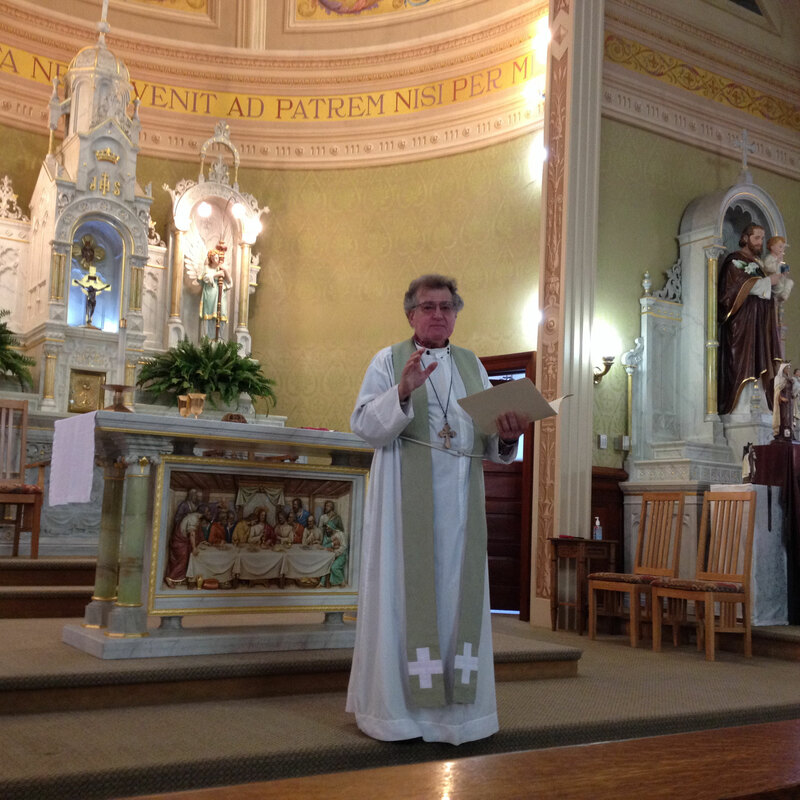 Donald Kinney, OCD, the Provincial Delegate from the Arizona-California Western Province concelebrated Mass. 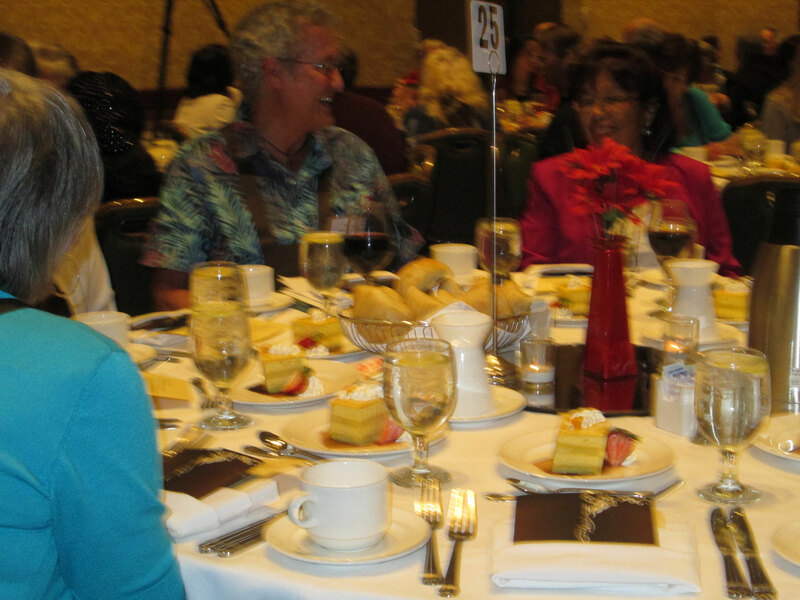 Front Row Left to Right: George Wing from Chico, Ed and Kay Hilario from Redding, Jean Sargent from Red Bluff, Fr. 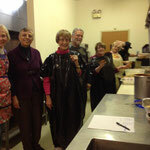 Donald Kinney, OCD from San Jose (monastery), Diane Dickson and Sandy Van Loan from Redding, Elaine Kaufmann and Jane Shea from Red Bluff. Back Row: Fr. Jonathan and Mary Lorenz from Redding. An official VMG virtual choir, "Salve Regina" is the one of two virtual choirs produced for the celebration of St. Teresa of Jesus's 500th birthday. This virtual choir is made up of Carmelite Nuns and Friars from around the world and highlights the internationality and diversity of the Carmelite Order. Music composed by Claire Sokol, OCD. 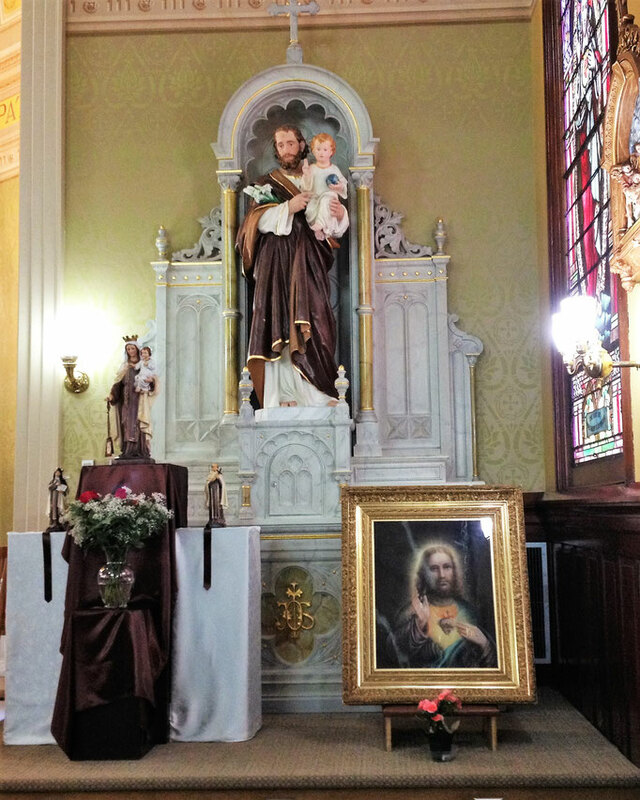 This was first seen by approximately 350 Carmelite friars, nuns, and Secular Carmelites at the 500th Birthday celebration of St. Teresa of Avila in San Jose, CA. 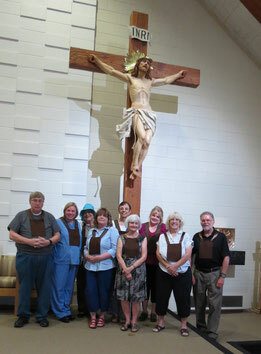 Seven Secular Carmelites from our Red Bluff group attended this amazing 3 day event in San Jose at the Fairmont Hotel. The second virtual choir, "Nada Te Turbe" is also posted below. 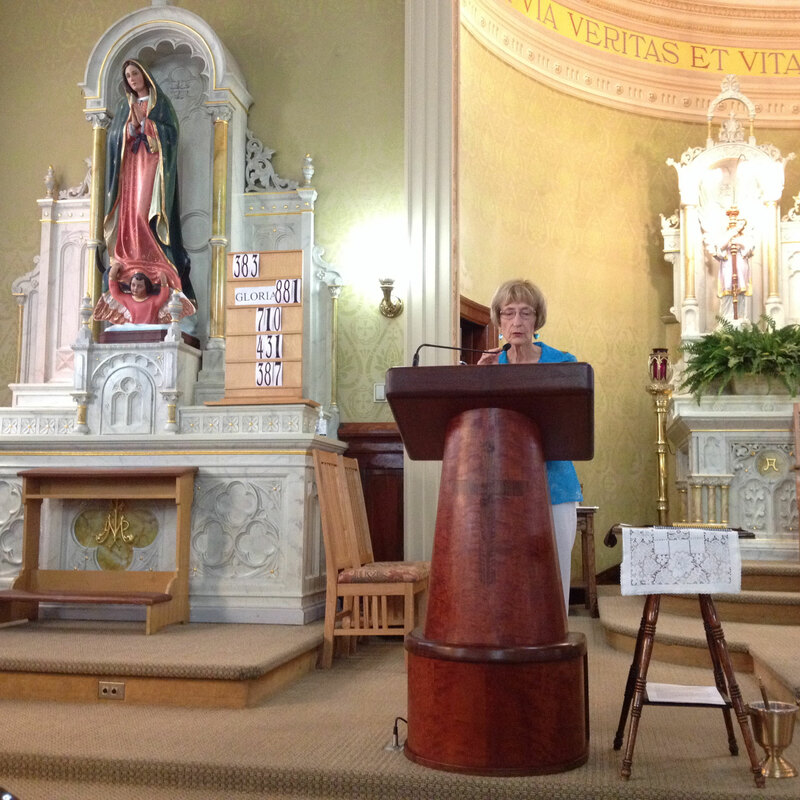 The St. Teresa of Avila 500th Birthday Celebration in San Jose Highlights. Beautiful!! 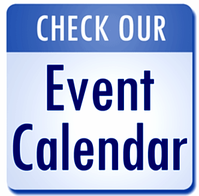 Attended by 7 of our Red Bluff Secular Carmelite group.